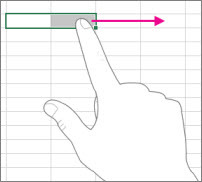 If you’re new to Office with Windows 8 on a touch screen, learning a few gestures will help you get up to speed. Here’s how they work in Office. Tap the Full Screen Mode button on the title bar. Or tap the Ribbon Display Options button on the title bar and tap Auto-hide Ribbon. Tap the three dots at the top of the screen, and then tap the Exit Full Screen Mode button. Or tap the Ribbon Display Options button and tap Show Tabs and Commands. Tap the Touch Mode button on the Quick Access Toolbar. Or tap the Touch/Mouse Mode hand icon on the Quick Access Toolbar and tap Touch. Or tap the Touch/Mouse Mode hand icon on the Quick Access Toolbar and tap Mouse. 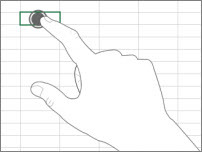 Press, hold, then release any button on the Quick Access Toolbar. Choose what you want to do from the menu that appears. 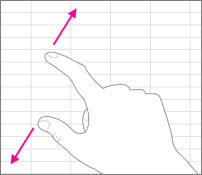 Tap the Touch Keyboard button on the taskbar. Tap the X button on the Touch keyboard. Tap Dock on the Touch keyboard so that it stays open. Tap Undock on the Touch keyboard. Touch the doc and slide it up and down. Tap in the text and drag the selection handle. Tap the selected text, then tap a formatting option on the Mini toolbar. Touch the object and slide it. 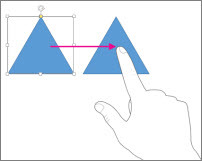 Tap the object, then press and drag the object’s resize handle. Tap the object, then press and drag the rotation handle. Tap a cell and drag the selection handle. Tap a cell to select it, tap it again to bring up the Mini toolbar, then tap Clear. Make a quick vertical flick on the slide, or tap the slide’s thumbnail in the Thumbnail Pane. In the Thumbnail Pane or in Slide Sorter View, make a short, horizontal swipe across each slide until the color of the thumbnail’s border changes. Drag a slide horizontally out of the Thumbnail Pane and drop it at the new location. Tap an object to select it, then tap and hold it while you tap the other objects. Swipe, tap Start, swipe up, tap All Apps, tap Control Panel (under Windows System), tap Appearance & Personalization, tap Display, and tap Medium – 125%.